Grain Food Group - What Are Grains? 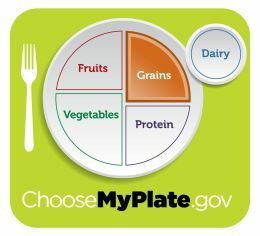 The orange section of USDA’s MyPlate illustrates the grain food group. Make sure that at least half your grains are whole grains. What is a Grain Product? Foods that are made or derived from barley, cornmeal, oats, rice, wheat, or another cereal grain are considered a grain product. The foodstuffs most readily identified, as grain products are grits, cereals, tortillas, bread, pasta, and oatmeal and breakfast cereals. What constitutes a refined grain is the fact that it has been through a mechanical process referred to as milling. Milling removes the germ and bran to give grains a texture that is finer than found naturally. Milling also improves the shelf life of grain products. However, while these may be considered product improvements, increased shelf life and finer texture quality, milling also removes many B vitamins, iron and dietary fiber from the grain. Note: “Degermed” refers to the thin skin of the corn kernel and has nothing to do with bacteria germs. “Enriched Grains”- What does it mean? Most of the nutrients are found in the whole grain’s germ and bran. Refined grains have had their germ and bran removed during the milling process. It means that almost all of its original nutrients (fiber, iron and many B-vitamins) are gone. The milling process is done because it gives finer texture and improves their shelf life, but at the cost of losing important nutrients. Because of the lack of nutrients in refined grains, most refined grains are being “enriched”. There are a number of refined grains that are referred to as “enriched”. To enrich a grain product, certain B vitamins like folic acid, niacin, riboflavin, thiamin and iron are put back after the grain has been processed. To make sure, check the ingredient list on refined grain products and look for the word “enriched”. Even after “enrichment”, refined grains do not have as many nutrients as whole grains. Furthermore, fiber is not added back in the enrichment process. Be aware that enriched refined grains and products that have been added with fiber rich bran are not necessarily whole grain products. Whole grain products have all its original nutrients including fiber; thus containing more nutrients and fiber than enriched grains. Those who eat whole grains as a part of a well-balanced and healthy diet have a reduced risk of developing chronic diseases. There are a number of health benefits to eating whole grains. Grains, especially whole grains, offer a variety of nutrients that are very important for a body’s health as well as maintenance. Whole grains are essential sources of vitamins B vitamins, magnesium, potassium, iron and selenium. Whole grains also provide fiber, which helps you digest your food and may prevent constipation. A fiber rich diet can also help you to lose weight. You will feel full longer when you’re on a fiber rich diet, and your body will burn additional calories to digest fiber. The fiber rich whole grains mostly have a lower GI than refined grains. A low GI diet means that your blood glucose level will be more stable and this will have positive effects in both mood and energy. The fibers in whole grains also fight against type 2 diabetes, obesity, heart disease and cancer. Many health organizations recommend eating at least twenty to thirty-five grams of fiber per day. Check the Nutrition Facts Label on your food products to determine the grams of fiber and choose those with three or more grams of fiber per serving. Reduced constipation: Eating foods that contain fiber such as whole grains may reduce constipation when eaten as a part of a healthy diet. Reduced risk of heart disease: Eating whole grain products as part of a healthy and balance diet can reduce the risk of developing heart disease. Reduced risk of neural tube defects during pregnancy: Grains fortified with folate prior to and during pregnancy help to prevent neural tube defects during the development of the fetus. How much is needed from the Grain Food Group? The amount of grain that is needed on a daily basis is contingent upon persons’ age, gender, and level of physical activity. As a benchmark, an adult woman needs minimum 3 ounces equivalents of whole grains every day, and a man needs about 3-4 ounces. However, the daily recommendation for a women is set to about 5-6 ounces, and 6-8 ounces for a man. What is most important to know about grain product consumption is that at least half of all the grains a person eats should be whole grains. Substitute: Substitution is the easiest way to ensure you consume more whole grains than refined grain products. Substitution is the key not just simply adding the whole grain product. Substitute wheat bread for white bread and brown rice for white rice. Add: Use whole grains in casseroles or other mixed dishes, such as adding barley to vegetable soup and bulgur wheat in stir fry and casseroles. Use alternative flour: Use oat or whole-wheat flour for up to half the flour you use when making things like muffins, waffles or pancakes or in other flour based recipes. Whole grain products may require more leavening than refined grain products. Replace: Use a whole grain, unsweetened ready to eat cereal as salad croutons or use them to replace crackers you use with soups. Try something new: Try 100% whole grain crackers and snack crackers.